Byron Bay’s Julian Rocks is one of the few snorkel sites where you can swim with tropical species found on the Great Barrier Reef as well as animals from Australia’s deep Southern Ocean. Here the reserve is home to three different species of sea turtle, an assortment of rays including mantas, hard and soft corals, friendly wobbegong sharks and over four hundred different species of fish. All of this is only a five-minute boat ride from Byron Bay. A snorkel trip to Julian Rocks Marine Reserve takes three hours from start to finish, with an hour in the water snorkeling and includes the boat ride, equipment hire (mask, snorkel, fins and wet suit) and a free snorkel lesson (if required). Whilst snorkeling you are supervised by qualified dive staff who will ensure you get the most from your trip to Julian Rocks Marine Reserve. You will be amazed by the diversity and colour found in the clear shallow waters. A free snorkel lessons is offered in the on-site heated pool to those of you without a lot of experience or wanting to get acquainted with the equipment before heading out to Julian Rocks. These lessons start 30-minutes prior to the meeting time, let your local operator know if you would like to book in for this. Please note that all snorkel tour participants must be able to swim and be comfortable in the water. Before reaching Julian Rocks one of Australia’s most spectacular dive and snorkel sites you will watch a safety briefing video, be provided with snorkel, mask, fins and wet suit by one of our friendly crew and instructed where to leave your bags, valuable items and personal belongings. Once you reach Julian Rocks, your skipper will give you a briefing showing you the best spot to snorkel! 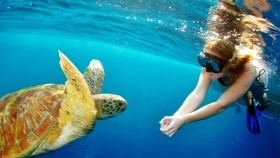 You can then enjoy up to 1-hour in the water snorkeling with three different species of sea turtle, an assortment of rays including mantas, hard and soft corals, friendly wobbegong sharks and over four hundred different species of fish. Whilst snorkeling you are supervised by qualified dive staff who will ensure you get the most from your trip to Julian Rocks Marine Reserve.